So that’s it. I’m now officially bionic. They have rebuilt me. My experience of the surgery was overwhelmingly positive. As soon as I came round, things felt different and better. Although I was in not inconsiderable pain, my shoulder felt fundamentally right; a feeling which I hadn’t had in the preceding week and a half. Almost immediately, I could use my arm again. The down side is that even now—just under a week after the op—the range of motion of my shoulder joint is pretty shoddy, and will need a lot of painful physio to get right again. Although maybe I’ll wait until the bruising goes down first. My main problem right now, and for the last two and a half weeks—apart from the range of motion—is one of sleep. Last night I managed a mostly-uninterrupted night, although I still needed to augment it with a bunch of micro-naps throughout the day. I’m still pretty tired most of the day, but in a normal work week, that’s not a million miles out of the ordinary anyway. The negative which bugged me about my time in the care of the NHS was its customers. I love the NHS. I genuinely do. It’s an institution of which Britain should be proud. Sure, it’s not perfect, but the idea of universal healthcare is just right. The downside to a system which caters for everyone, irrespective of background, is that it caters for everyone, irrespective of background. What I’m trying to get at here is that I object to having to share a bay with two smackheads. I’ll write more on that aspect of my stay later. 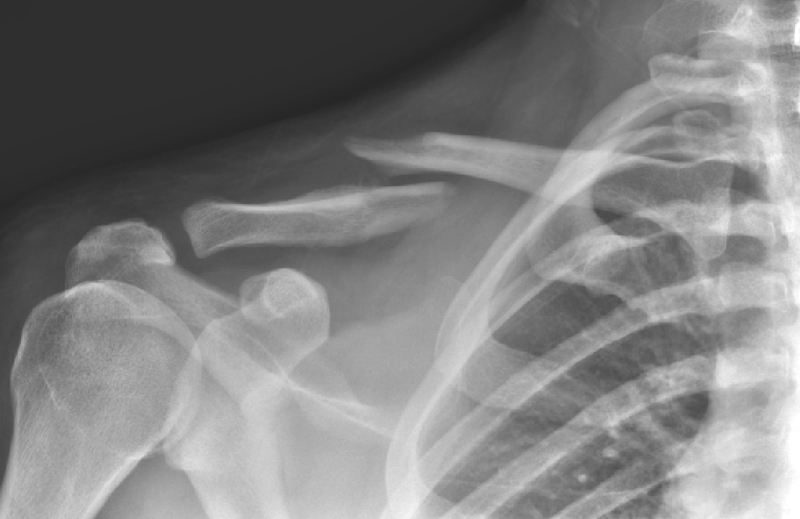 About 2 hours after hearing a clicking noise from my collar bone, here’s what I looked like. The break is clean in two, but there’s a ton of overlap so no indication that things won’t heal without intervention. A week later, this is no longer the case. 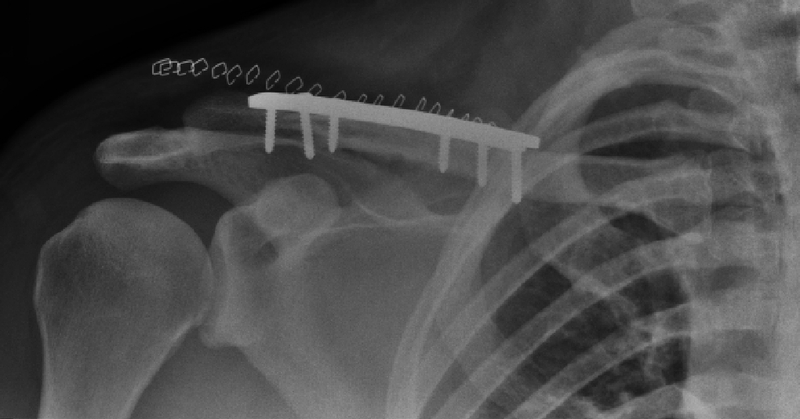 the two halves of what was once my lovely intact collarbone now want nothing to do with each other. They’d rather spend their time hurting me and stopping me from sleeping. Surgical intervention is now a necessity. Here’s the outcome of that intervention. For scale, the screw on the left is about 22 mm long. The things floating above my collar bone are the 21 staples holding me together on the outside. 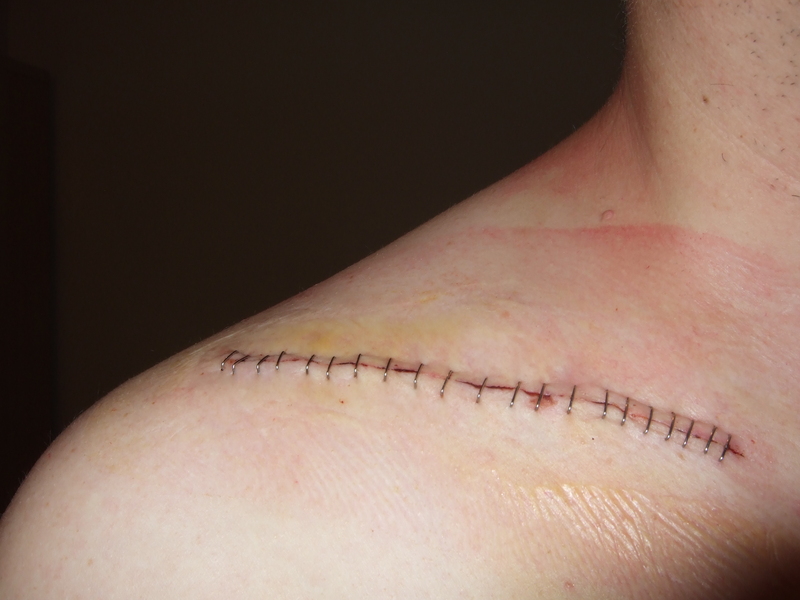 And here’s what they look like on the outside, when I had my dressing changed. In a nutshell, what I’m trying to get at here is that I’ve had better weeks.